Jonathan Nolan’s short story “Memento Mori,” published in Esquire in 2001, and Christopher Nolan’s Memento, released in 2000, blend a black, jagged sense of humor with sobering thematic meditations on time, memory, knowledge, and grief. Focusing on a man suffering from short term memory loss, or anterograde amnesia, they present a character adrift in space, time, and experience, whose life is a waking kaleidoscopic nightmare of conflicting details, an endless repetition of first encounters and first impressions. He describes it as waking up, experiencing the same confusion and disorientation we all do when we get out of bed in the morning, but for him it happens roughly every ten minutes. While “Memento Mori” is all internal, capturing Earl’s setting, thoughts and actions without the introduction of any other characters or dialogue, the movie Memento, an aggressively nonlinear riddle tangled up in a dizzying, elegant spiral structure that moves backwards, forwards, and sideways, sometimes at the same time, takes the basic idea of the story and develops it into a feature length film, expanding and changing it to fit the requirements of the medium while maintaining the same darkly comic tone and general idea and backstory. ***This is a comparative essay and it contains spoilers. “So where are you? You’re in some hotel room; you just wake up and you’re in a motel room. There’s the key. It feels like maybe it’s the first time you’ve been there but somehow perhaps you’ve been there for one week, three months. It’s kinda hard to say. It’s just an anonymous room.” These words open Nolan’s film, and perfectly describe Leonard Shelby’s (the name has been changed) condition. “I have no short term memories,” he tells people. “I know who I am; I know all about myself. Since my injury I can’t make new memories. Everything fades.If you talk for too long, I’ll forget how we started, and the next time I see you I’m not going to remember this conversation.” Because of the director’s brilliant idea to shoot the film from end to beginning, in forward moving increments of about five minutes, we are as lost as the character. We’re meant to be confused as we stumble back, learning the effect before the cause; telling the story in reverse order forces us to identify with Leonard (played movingly by Guy Pearce as a man who is at once utterly clueless and fanatically assured)—like him, we have no idea what happened five minutes ago and how he got to where he is. In the film as well as the short story, the character writes himself notes and takes pictures to remind himself of the death of his wife and his need to avenge her; he’s turned his body into a giant memo pad, covering himself in clues leading to the identity of the killer. As the movie lurches backwards, we see how he gleaned each piece of the puzzle, and we (and Leonard) assemble the psychic strands of his life, so, with each revelation, the picture changes dramatically, becoming an examination of shifting realities and self-serving motives. The story starts similarly out of context, with one of its extended sections written in italics, which we assume are the notes Earl has written to himself. It discusses the picture on his wall of him at his wife’s funeral, of which, of course, he has no recollection; he has to discover her death every ten minutes, making the pain new and fresh again. “Give it five minutes, maybe ten, Maybe you can even go a whole half hour before you forget. But you will forget—I guarantee it (…) How many times do you have to hear the news before some other part of your body, other than that busted brain of yours, starts to remember? Never-ending grief, never-ending anger. Useless without direction.” The character has no life; how could he? He is dead already, the only reason to keep on breathing his quest for revenge. As in the film, Earl is introduced upon waking, as he “opens one eye after another to a stretch of white ceiling tiles interrupted by a hand-printed sign taped right above his head, large enough for him to read from the bed.” This exact paragraph is repeated less than two pages later, giving readers an idea of what it must be like to be unable to form memories, to be caught in a continuous loop of repetition, performing the same actions over and over, living the same moment again and again without any recollection of it. The act of waking up, of opening his eyes, is also important; it refers not to the act of ceasing to sleep necessarily, but to his constant condition of forgetting what has gone on before and having to start all over again. The story captures Earl waking up a total of six times, once on nearly every page, and the description of the actions following his awakening are always similar, except in the final section, which starts with, “Earl’s eyes are wide open.” The first time he is presented as conscious and alert is after he has killed who he believes is his wife’s murderer. In the film, the screen fades to black after each section and then back, a perfect visual representation of opening one’s eyes. Every time he wakes up in “Memento Mori,” Earl relies on the notes he has left himself to make sense of his surroundings. The room in the beginning of the story, a hospital room, is appropriately white, “overwhelmingly white, from the walls and the curtains to the institutional furniture and the bedspread.” Like his mind, it is completely blank, with no defining characteristics or color. In contrast, Jonathan’s brother Christopher and cinematographer Wally Pfister bathe the film in bright, super-saturated colors, perhaps to suggest the wealth of detail Leonard takes in every second of his life, because he’s seeing everything for the first time, or he might as well be. Earl’s segmented existence comes in increments—the products around him are single-serving; even his water comes in spurts, just like his consciousness and memory: “The shelves are stocked with single-serving packages of vitamins, aspirin, antidiuretics. The mouthwash is also single-serving, about a shot-glass-worth of blue liquid in a sealed plastic bottle,” and “the tap is of the push-button variety—a dose of water with each nudge.” The anonymous hotel room he wakes up in later in the story doesn’t have a note on the ceiling, but a mirror. “Look to yourself for the answer,” Earl tells himself. “After all, everybody else needs mirrors to remind themselves who they are. You're no different.” But the mirror in the cheap motel room is cracked, “the silver fading in creases”; his identity, which he hopes to discover in the reflection, is fundamentally shattered and defective. Earl—like Leonard—distorts reality as a broken mirror does. Mirrors, as reproductions, repetitions of reality play a metaphorical role as well. As Earl bends over to look at the picture of himself at his wife’s funeral, “for a moment this looks like a hall of mirrors or the beginnings of a sketch of infinity: the one man bent over, looking at the smaller man, bent over, reading the headstone.” This image is a representation of the mise en abyme that is his entire life—an infinite reproduction and repetition of the same moments. The opening to Christopher Nolan’s movie might be even more confusing. Over the opening credits, we see a Polaroid picture of a murder scene fading instead of developing. The blood seeps up the wall and into the wound, a bullet flies out of a man’s head and back up the barrel of a gun, and the body comes back to life briefly. And if most of the film is told in segments arranged in reverse order, there are also black and white scenes taking place in a motel room told in chronological order that tell the tragic, oddly parallel story of Sammy Jankis (Stephen Tobolowsky), a man suffering from short term memory loss whom Leonard investigated when he used to work for an insurance company. Of course leaving it at two parallel story lines would have been all too simple, so the scenes in the motel room loop back on themselves, the final black and white scene turning almost imperceptively to color and becoming the first (in chronological order) section of the backwards main story line. “Sammy’s story helps me understand my own situation,” Leonard explains. Trying to figure out if Sammy is faking it, or if his condition is mental of physical, Leonard paints a poignant picture of his own ailment and how it might affect those around him. Sammy’s wife (Harriett Samson Harris) captures the escalating desperation of someone trying to hold on to a normal life as the floor is kicked out from under her, while her husband seems to have entered the serenity of dementia; the lost, benign little smile on his face becomes more heartrending as the movie goes on. “Must be tough living your life according to a few scraps of paper; you mix your laundry list with your grocery list, you eat your underwear for breakfast,” Natalie (Carrie-Anne Moss) comments in Memento. But the lists have to be based on facts, and Leonard, as Earl, must trust them completely. Surprisingly, the scenes that are called into question the most in the film are not the jumbled ones taking place after the accident, but everything that transpired before—the back story that is presented to us in flashbacks, flashbacks from the memory of a man with brain damage. Even if Leonard were a reliable narrator and the memories of his previous life were indeed intact, they are not necessarily accurate. “Memory’s unreliable,” he says. “Facts, not memories, that’s how you investigate (…) Memory can change the shape of a room; it can change the color of a car. Memories can be distorted. They’re just an interpretation, they’re not a record, they’re only relevant if you have the facts.” His notes and scribbles, his Polaroids and tattoos, according to his own logic, are more reliable than the remembrance of his entire life before the incident. We believe everything that happens in the main story line of the film because we are witnessing it alongside the character, because we make the connections, revise them, and overturn them as we learn more, and there is no reason to question what we see. 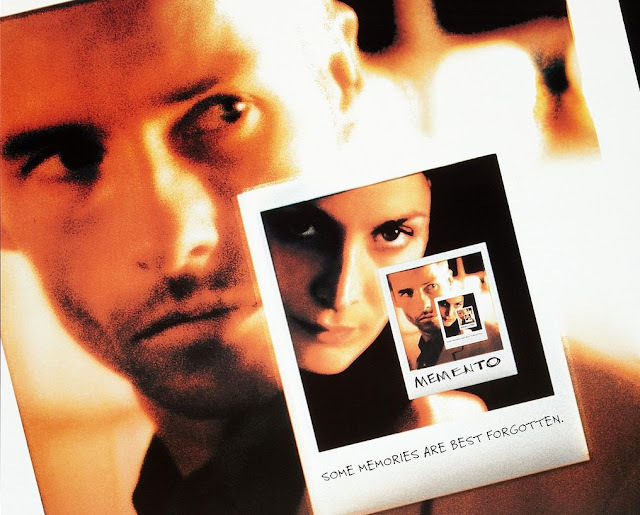 Memento, like the short story it’s based on, is a film about memory, about the ways in which it defines identity, how it’s necessary to determine moral behavior, how terribly unreliable it is, and how it’s linked to grief. “How am I supposed to heal if I can’t feel time?” Leonard asks. Because the passage of time can’t heal his wounds, his hurt remains raw and unappeased. “Time is theft, isn't that what they say? And time eventually convinces most of us that forgiveness is a virtue. Conveniently, cowardice and forgiveness look identical at a certain distance.” Most people can forget and forgive, but Leonard and Earl, for all their forgetfulness, are forever trapped in a state of anger, guilt, and grief. Only revenge can assuage their wounds, or so they think. “The passage of time, well, that doesn't really apply to you anymore, does it?” Jonathan asks. “Just the same ten minutes, over and over again. So how can you forgive if you can't remember to forget?” Time cannot heal Earl or Leonard’s wounds, because time has no meaning to them, a fact symbolized in the story by the loss of Earl’s watch. “It's not so much that you've lost your faith in time as that time has lost its faith in you. And who needs it, anyway? Who wants to be one of those saps living in the safety of the future, in the safety of the moment after the moment in which they felt something powerful? Living in the next moment, in which they feel nothing. Crawling down the hands of the clock, away from the people who did unspeakable things to them. (…) Time is three things for most people, but for you, for us, just one. A singularity. One moment. This moment. Like you're the center of the clock, the axis on which the hands turn. Time moves about you but never moves you. It has lost its ability to affect you.” And if he kills the man he’s after and can’t remember it, then he can just do it all over again, “conjure up that necessary emotion, fresh as roses.” He’s forgotten to move on to the next step on his list, or, in the film, ignored that he had completed the previous ones, taking pages out of the police file, jotting down Teddy’s license plate number to incriminate him, lying to himself in order to be happy, to have a purpose. Leonard’s residual code of honor pushes him through a fog of amnesia toward what he feels is his moral duty. 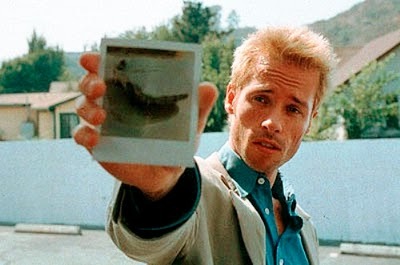 Like a neo-noir that takes place mostly in the California sun, Memento offers us a flawed, silk-suited hero trying to find some measure of justice in an unjust world as other characters, seemingly friends, become foes and femmes fatales. Leonard has no idea he’s become just an unwitting cog in a manipulating machine, an Everyman caught in a potentially infinite purgatory, blindly trying to revenge an act that has already been avenged. He thinks his wife deserves vengeance regardless of whether or not he can remember having administered it: “Just because there are things I don’t remember doesn’t make my actions meaningless. The world doesn’t just disappear when you close your eyes.” But what if it did? What if nothing were certain, factual, real? Is Sammy’s story a hint that Leonard’s condition might not be real? Or is his condition, like he thought Sammy’s was, psychological and not physical? Is Leonard’s story real, or are the confusing final scenes just evidence of Leonard’s brain synapses misfiring as he sits in the asylum? In the story, he started in an asylum and escaped. Was he ever there in the movie? 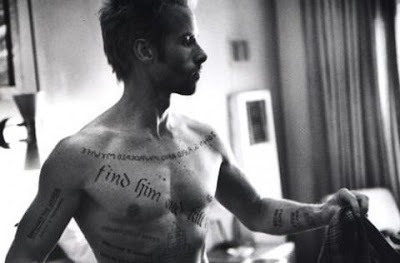 “Your advantage in forgetting is that you'll forget to write yourself off as a lost cause,” Jonathan writes in “Memento Mori,” and the same idea goes for Christopher Nolan’s adaptation. The story, in a very limited space, puts forth the basic idea and principles behind the movie, and its unforgettable, no pun intended, main character. More internalized and philosophical and less action filled, it is still thrilling to read, and different enough from the movie so that both can stand side by side as different works of comparable value. The film certainly lives up to the expectations of the short story, and in certain moments of isolated brilliance might even surpass it. More than a puzzle or an ingenious thriller, Memento is a philosophical tragedy that demands the sort of attention and thought that Hollywood would never ask of viewers. The Nolan brothers have used their cleverness and unmistakable originality to stir up questions and feelings about the most basic issues of how we experience reality.